Back in 1992, my wife was driving to work near Detroit, Michigan. On an isolated road in broad daylight, she came upon a car in front of her that was not moving. 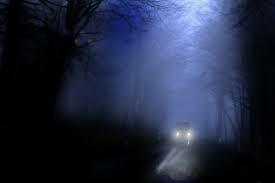 She slowed down and the car was engulfed in fog and completely disappeared right before her eyes. There was no side road or anywhere it could have gone. It vaporized completely. She cautiously drove through the area where the car had been and went to work. She was so shocked by the event, it was several days before she could speak of it to anyone. To this day she has no idea what went on in Detroit, Michigan.